What makes us win the title, “Cheap driving lessons in Melbourne”! We do the hard work of market research by comparing our prices with other schools regularly to keep our pricing unbeatable in terms of price and quality. We then apply further reduction on the price considering some people are unemployed, are students or are on a budget to ensure that our prices are affordable for everyone. Please see our latest pricing for the lessons and services: pay each time rate, wholesale lesson package rate, combined lessons plus drive test bundles, only for the test day warmup lesson and car for test package! I always like to shop around for deals and realised that when I added up the total cost, I found Ideal’s lesson cost is cheaper than the others. Also they were reliable so I continued with them and got my licence on my first attempt! With a package, you can secure your lessons at a cheaper rate ahead of those who are in an open pay as you go rate. This will also ensure that, generally each time you will get the same car to drive along with the same instructor during all your lessons! Buy 10 get 1 free. Manual $850. Buy 10 get 1 free. Manual $580. You will have the opportunity to lock-in your instructor's car for the actual drive-test at a discounted rate which you will use for your lessons prior to the day of licence test! Statistic shows that, having the same instructor's car during all the lessons and during the "car drive and skills test" can increase your chances of passing the test! If you already booked the drive test, we will try to arrange an instructor who is available and has expertise at that particular VicRoads. If you haven’t booked the test, just mention your preferred VicRoads when you book online with us so that we can arrange an instructor who will guide you to make a booking with VicRoads according to his/ her schedule. νm; General conditions: Changes/cancellations require a minimum of 24 hours’ notice directly to the instructor, otherwise the full fee is payable. The licence packages price is same for cars with either automatic or manual transmission (unless otherwise stated). On a package deal, you must be flexible and available for 1 full day or 2 half days to get a lesson slot each week. All packages are non-refundable, transferrable; expire within 3 months from the day of your first lesson! νm; If you are 100% happy at the end of your first lesson with the instructor and car, you need to pay the full amount of the package you choose directly to your instructor and then you may not change instructor or car within that package! If you wish to pay each time, PAYG rate will apply. Our price does not include any VicRoads fees; they are separate and payable directly to VicRoads. νm;1 45 minutes lesson packages are to be used one lesson each week Monday to Friday (excluding public holidays) between 9am - 5pm by Victorian learner permit card holders only. 60 minutes and 90 minutes packages do not have the above restrictions. Pay-as-you-go rate (PAYG): $42/45 minutes, $55/60 minutes, $80/90 minutes, (Manual $44, $58 and $85 respectively)!Car only for the drive test $130 (manual $140)unless you purchased one of our licence packages!. νm;2Price for automatic car, $10 extra for manul car. You need to select the appropriate VicRoads by the end of the first lesson and book the drive test as per your instructor’s availability unless you booked prior and advised us at the time of booking the first lesson. The last lesson of the package to be taken as a warm-up lesson on the day just before the actual drive test! Please try (optional) to meet and finish at that VicRoads car park for all the lessons and drive test so that you get enough practice on the current test routes! You can take up to 3 hours lesson together if you are in hurry so that you can complete the course within 1 to 3 days! νm;3 Price for automatic car, $10 extra for manul car. Easy hassle free re-test claim: In order to claim the 1 free re-test to the same VicRoads at no cost (use of the instructor’s car for the 1 retest, meet and finish at VicRoads), you need to re-book the drive test to the same vicroads as per instructor's availability. For the free-retest offer, VicRoads fees still apply payable to VicRoads directly. νm;4 Manual car costs $10 extra. Sometime the cost of test day only packages goes up or down depending on various factors like instructors availability, distance to travel if it's a pickup, the distance of VicRoads, drop off required or not, etc. All you have to do is just click on book online button located next to your preferred package rather than calling us and supply us with the above information. We will assess your circumstances and get back to you usually within an hour with the best deal (obligation free)! You must meet all legal requirements (for example: carry your Victorian learner permit card or appropriate licence, documents required by the law/ VicRoads, etc.) every time you go for the driving lesson and drive test. Additional terms and conditions that apply can be found on out Terms and conditions page! Get an idea of the total cost of the lessons and licensing fees in just few seconds to help you plan your budget before you commit to any lessons. This also helps you choose the suitable package in addition to the instructor’s recommendations during your first lesson. Other factors you need to consider when calculating the total cost are: Your ability and willingness to learn, outside practice opportunities apart from the lessons, meeting the instructor at VicRoads to get ready for test, etc. There are 2 parts to the cost: one is the VicRoads fees at different stages (Fixed price, need to pay the same if unsuccessful). As of 2017, breakdown of VicRoads fees below: for Learner permit knowledge test (including appointment fees): $40.90, Issue learner permit card: $23.70, Hazard perception test (including appointment fees):$35.50, booking fees for drive test $60.70, transfer/cancel $17.80, issue 3 years licence $77.90. You also need to pay the driving school for letting you use their car and the instructor for your training and drive test. Here you also need to pay each time you took the service (excluding 1 retest on licence guarantee package). Our lesson price is competitive and cheap. You can get close approximation of the total amount to pay to Ideal Driving School once you take a lessons, as you will get a better idea of how many lessons you might need. Compare lesson cost vs. durations: pros & cons to save even more! Most driving schools offer minimum lesson duration of 45 minutes and other common durations are 60 minutes and 90 minutes which makes you confused when you are comparing the pricing among them to get a good deals on your lessons! As one of our missions is to offer cheap driving lessons, we kept it simple for you to work out the cost. Here are facts to help you better understand and choose the correct lessons bundle which will not only give you the lowest price but will also meet any other requirements you may have. This is correct when you use this to compare price regardless of which Melbourne driving school you compare with. You can read the article below about what facts you need to consider in determining whether you should consider 45, 60 or 90 minute driving lessons. Generally this is the most expensive lesson even though it looks cheap (We will show you how in the next paragraph). The other major disadvantage of having a single lesson is, when you want to practice a driving task few times after they are first taught, most of the time your time is up! This is cheaper compared to single lesson. Just multiply cost of a 60 minute lesson by 0.75 to find out the truth. This lesson gives you just enough time to not only learn more but also practice a few times to ensure you actually understand what is been taught to you by your instructor. Intensive 1.5 hours lesson is the cheapest lesson. Just multiply cost of 90 minutes lesson by 0.5 to find out the truth. This lesson gives you enough time to not only learn more but also practice few more times to ensure you actually understand what is been taught to you by your instructor. Pay cash on the day, receipt will be given upon request. Some instructor also accepts EFT or mobile payment! 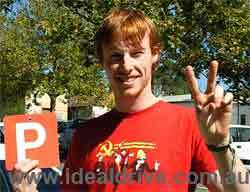 © 2008 Ideal driving school, Victoria, Australia.